Among the five Boston youths who were chosen for this year's Teen Positive Image Awards as a result of demonstrating positive contribution as to their communities was the 18-year-old Ghanaian Sandra Appiah, a senior at English High School who lives in High park. 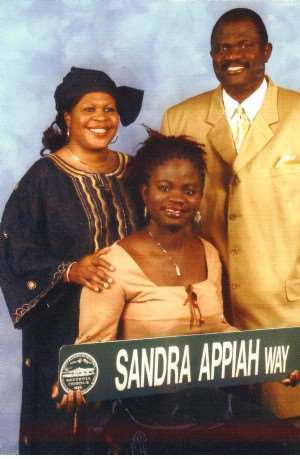 Sandra Appiah arrived in the U.S. just 3 ½ years ago as vocational student from Ghana. She will graduate from High School this June. Her apt intelligence is evident in the field she has showed much interest and nursing is not the least. Sandra Appiah volunteers in the Somali Youth Program, an after School and Summer programme at English High School that offers academic and life skills support for refugee and immigrant teens. She was selected as a delegate to the Anytown Youth Leadership Programme, and as a member of the Civil Rights Team at English High School assisted in the formation of Africans Around the World Club. This club seeks to establish common grounds among the students at English High from Africa and the diaspora. This act of zealous participation among the youths in society building in the Boston community indebted the Deputy Mayor to name a street after Sandra Appiah alongside the other four youths.